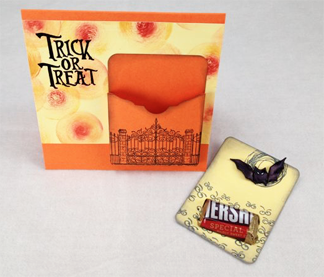 Trick or Treat Goody Card. As we get closer to the big "sugary, candy, overload" on the evening when the "Great Pumpkin" returns (did you all watch Charles Shultz - Peanuts Special "It's the Great Pumkin, Charlie Brown" cartoon??). Do you need a cute card to give some of that candy to that special someone? Here's a project you might want to try. Just Click HERE for the Link to WhenCreativityKnock.net to see the how-to-video. There are lots of steps for this project, and each one features a product from the sponsors for the All Star Designer Holiday Series. If you don't have all the tools or products, don't fret...there's options especially when you put on your Creativity Hat. It's all about opening your closet and start cutting, decorating, and gluing...even if it means you have to give away that cute little candy bar that you've been eyeing for yourself. Ya never know...this could be one of the cards made for our swaps. It would work for the ATC or Card of the Month (COTM) swaps and even for a fun Birthday card for the Birthday swap. Just change the color theme and images for the right season. 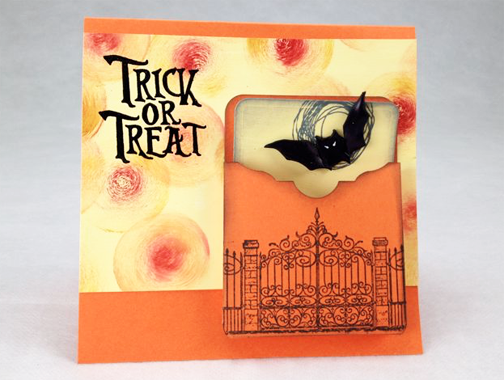 And really, if I got a Halloween card in Feburary, I would love it. Any handmade creation is fabulous even if it's VERY early!! I love this and what a great card for any occasion!